The carcasses of 30 whales that have stranded along the Gulf of Alaska and the Alaska Peninsula have puzzled scientists since the first discoveries this May, and now NOAA is giving the cases “unusual mortality event” status. That means that the stranding event is unexpected, involves a large number of marine animal deaths, and requires immediate attention. The designation gives the agency more resources for the investigation. Since May 2015, 11 fin whales, 14 humpback whales, one gray whale, and four unidentified cetaceans have been found dead around the islands of the western Gulf of Alaska and the southern shoreline of the Alaska Peninsula, according to NOAA. Canadian authorities are also seeing an uptick in whale deaths off the coast of British Columbia. 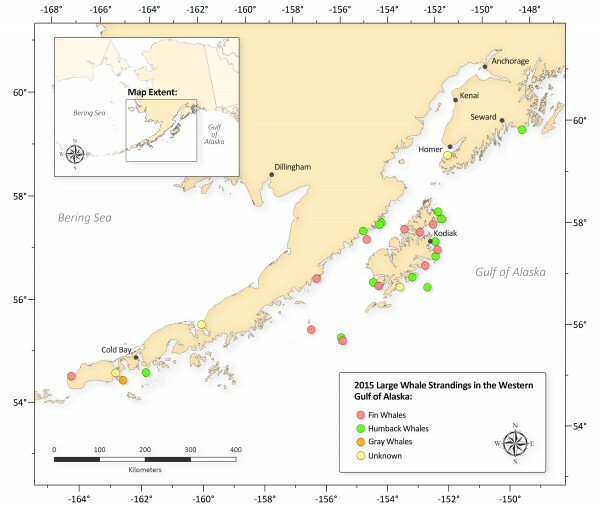 NOAA Fisheries is declaring the recent deaths of 30 large whales in the Gulf of Alaska an unusual mortality event, triggering a focused, expert investigation into the cause. Graph: NOAA. The reason for the whale deaths is unknown, but scientists are hypothesizing that biotoxins due to an unsually warm patch of seawater may be involved. At a media teleconference today to discuss the new UME status, NOAA Fisheries lead marine mammal scientist, Teri Rowles, says they’ve tested one whale out of the 30 reported. They have run some tests for biotoxins, but so far the tests have been inconclusive. Rowles says the sample they collected tested negative for domoic acid — a toxin produced by algae that thrives in warm seawater conditions. Rowles says they can’t say for certain that the whale was not exposed to biotoxins. In order to rule-in or rule-out possible causes of the whale deaths, she says they need more samples, but big whales are difficult to access in order to conduct necropsies. 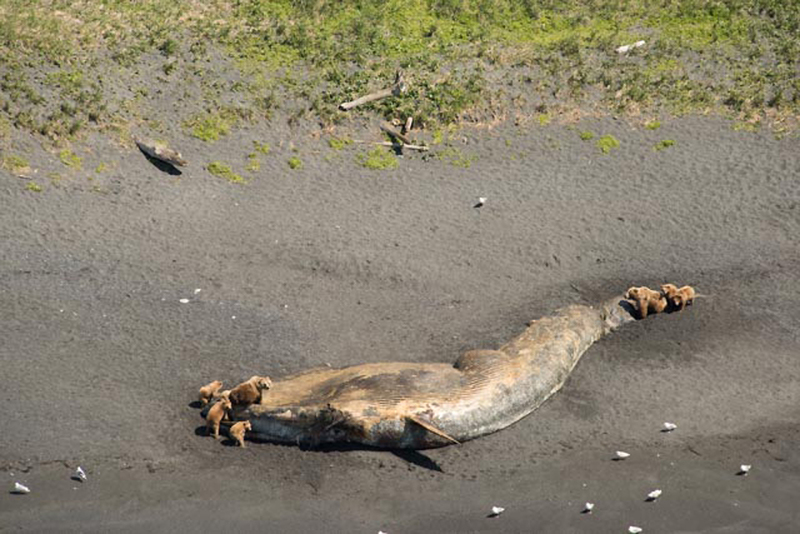 Bears feeding on a fin whale carcass in Larson Bay; Alaska; near Kodiak. Credit: NOAA; June 13, 2015. Many of the whales have washed up in the Kodiak Archipelago. Marine mammal specialist Bree Witteveen says there are a few reasons why that could be. One is the high number of fin, humpback, and gray whales that already pass through those waters during summer. Rowles says the next step is to put together the investigative team and pull the data together. She says it’ll be a slow process and it could be a while before they find an answer, if they manage to reach one.